Pick up one of the Civic Council’s “No Flyers, No Ads, No Menus” signs at the following locations for $2 (to partially cover the cost of printing). Tarzian Hardware, Seventh Avenue between Second and Third Streets. The signs are laminated and designed to be tied into wrought iron gates. 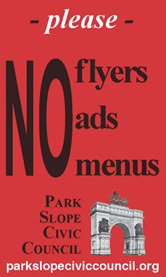 The Park Slope Civic Council sign is not technically compliant with the new Anti-Flier Law which mandates that the sign be 5″ x 7″ in size, that each letter be 1 inch in height and that specific wording be used.